The University of Alaska Fairbanks will take ownership of Gakona’s High Frequency Active Auroral Program, best known as HAARP. After two bumpy years waiting for the US Air Force to decide what to do with HAARP, UAF has won it’s bid to take over the facility for research purposes. About a year ago, [June of 2014] UAF, with the support of scientists around the globe, managed to delay the Air Force’s plan to close and demolish the HAARP compound. UAF spokeswoman Marmion Grimes says UAF will take ownership of the $200 million facility next month. The university must still negotiate with the military for 1500 acres of land out of the 5500 acres the Air Force owns in Gakona. The university system is loaning UAF $2 million dollars to get the facility back into operation. Grimes says a plan is in place to raise money to cover the loan and costs associated with operations. Bob McCoy, who heads UAF’s Geophysical Institute, has been instrumental in pursuading the Air Force to give HAARP to the university. 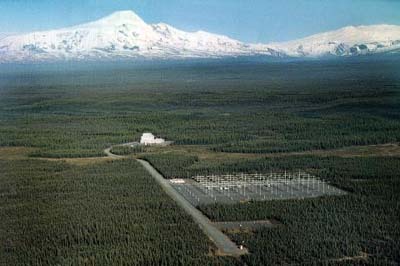 HAARP is one of only three similar facilities in the world. One is in Norway, another in Russia. Research into the Earth’s ionosphere was the primary job at HAARP when the Air Force operated it. But in June of 2013, the military announced that research was coming to an end, and made known it’s intention to shutter HAARP. Last July, HAARP was saved days before bulldozers were ordered to move in. Grimes says scientists rallied to put pressure on the Air Force to scrap the demolition plan. UAF faculty and graduate students have used HAARP for research over the past few years, and now the university plans to expand programs there. Bob McCoy says HAARP turns the ionosphere into a laboratory. Angels Don’t Play This Haarp, authored by Nick Begich.